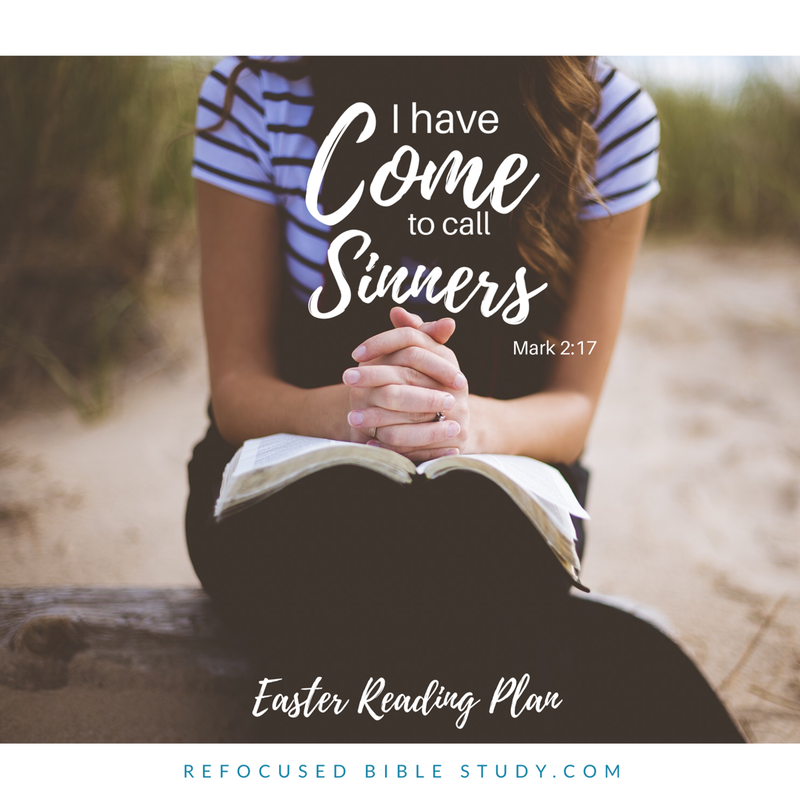 We are in day 2 of “Mark, a chapter a day for Easter here at Refocused Bible Study” here at Refocused Bible Study. You can find out about the plan here. We’d love for you to join us! 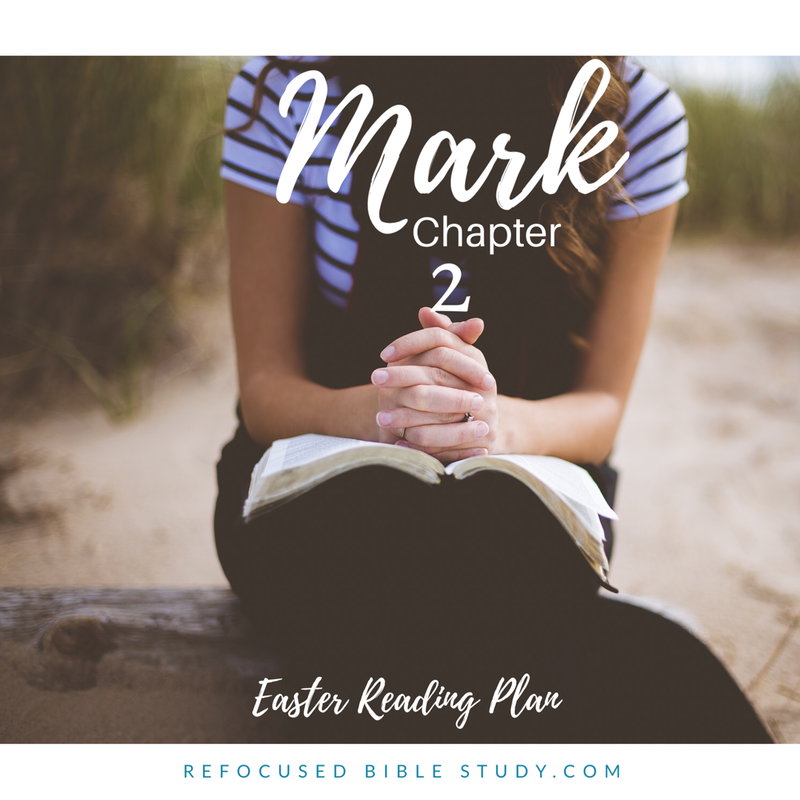 Today we are reading and discussing Mark chapter 2. Oh, how I wish I would have been at Levi’s dinner party with Jesus. The guests were not the ones who looked as if they had it all together religiously. They were “notorious sinners,” known for their impurities and looked down upon by the Pharisees. When Jesus is confronted about his decision to eat with “such scum,” he responds with a phrase that should shake us believers again today, making us double check and make sure our righteousness is in our faith in Christ alone. Do we know we are sinners? Although as believers, we may not have the lifestyle or be known for our sins like those eating with Jesus that night, it is important to remember that we will fall short every single day of the perfect love God lavishes on us. Everyday we need to ask him to search our hearts to see what sin may be taking root in there, underneath the surface, so he can pull the weeds up and keep the soil in our hearts soft and keenly aware of our need for him. Are we clinging to Jesus and what he did on the cross? Even Jesus said himself that there is nothing good in him but God himself. Our righteous deeds are like filthy rags. The only thing good in us is God. If we think for a moment that what we “do” for the Lord makes us worthy, then we are lying to ourselves. Do we see all people as God’s children, worthy of our Savior? Jesus’ rebuke of the Pharisees here is recorded for us to remember. Absolutely everyone is welcome to be introduced to Jesus. Whether they choose to follow him, is up to them. God makes it clear in scripture that he is being patient and desires to see everyone come to salvation. Make sure you are not writing anybody off. Start by praying for those around you who don’t know him. Love them and tell them about the Savior who doesn’t want them to “clean up” before calling out to him. Just as we are, he invites us. Thank you, Jesus. Share your verse of the day below in the comments! Tomorrow we discuss chapter 3! This passage always hits me in the gut and makes me take inventory of where I might be shutting out “sinners” in my life instead of welcoming them with the love of Christ. Thank for your the encouragement! That last point is so important! (Well, they all are.) I used to work in a school and one of the parents was really frustrating to work with (he purposely did things to frustrate us) and it got to the point where I knew that my frustration was obvious sometimes. I don’t remember what made me shift my mindset, but I finally decided that whenever I was frustrated I needed to make sure I saw him the way God sees him: as a beloved child of God. While I didn’t always feel the love, that shift in mindset helped with my frustration and definitely kept it at bay. He’s a beloved child of God. Now I take that with me and it’s definitely changed how I interact with people. Great reminders! We all fall short of being perfect Christians and need to be reminded. It is so important to remember that we are all God’s children too!